-- Bullfight is opening up early for soccer (futbol! ), 8:30 am on Saturday, February 27th for Real Madrid vs. Athletico Madrid. -- Scrumptious Chef returns to Tamale House East on Saturday, February 27th for a Creole dinner pop-up, along with a rare St. Arnold's beer tapping. -- The American Lamb Board's Lamb Jam is Sunday, February 28th at Barr Mansion. Tickets are sold out! -- Swift's Attic hosts a wild hog dinner on February 28th to benefit Operation Turkey, which provides meals and supplies for the homeless around Thanksgiving. $100/person. -- Metier hosts a book signing of Bien Cuit: The Art of Bread, March 2nd, 5 - 7pm. -- Farmgrass presents Farm to Feast fundraising dinner, March 3rd, $120. -- SPUN Ice Cream is holding a tasting in conjunction with Slow Food Austin on Monday, February 29th and an event at Metier Cooking Supply on March 5th. -- Celebrate Texas Independence with Jack Allen's Kitchen 6th annual Republic of Jack party, with $6 Republic Tequila specials. March 2nd, 5 - 10 pm. -- Central Market's bacon extravaganza will run at all locations March 2-15; sorry vegetarians! -- Russian House is hosting a smoked meats class, March 7th, $10/person. -- The Takedowns are back with the Meatball Takedown, March 13th at Shangri-La. -- Fast casual chain Blaze Pizza will celebrate (pizza) pie day on 3/14 with $3.14 pies. -- Fado Irish Pub will have a variety of events leading up to St. Patrick's Day, see their calendar for details for the luck of the Irish! -- The Austin Food and Wine Alliance will host legendary chef Jacques Pepin at the Long Center, June 5th. -- Sweet Ritual Ice Cream needs your help with their Kickstarter! They have just days left to make their goal. -- Need an early spot for breakfast? Patsy's Cowgirl Cafe is now offering breakfasts weekdays from 6 - 10:30 am; migas, flapjacks, even chicken fried steak with eggs! -- All locations of Kerbey Lane now have a spring menu; I got to try some of the items at a media tasting. 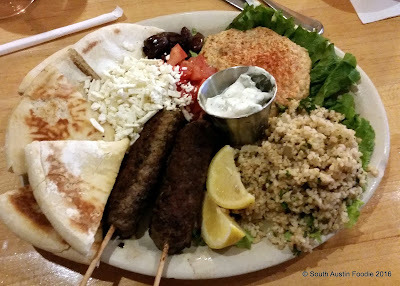 Banana bread French toast was delicious, as was the lamb kebabs on this Mediterranean plate. -- Oasthouse Gastropub introduces "Lunch Duets" with a choice of two lunch menu items for $10. -- Greenhouse Craft Foods will be partnering with the Round Rock Express at theDell Diamond to offer more wholesome gameday foods. -- Ramen Tatsuya (both spots) is now open from 11 am - 10 pm daily, with 2 - 6 pm "slurping hour" specials. Additionally, all broths will be offered. -- Kettle and Brine launches an e-commerce site. -- Vinaigrette opened at 2201 College Avenue (South Congress and Live Oak Streets). See my review here. -- Growler USA opens at 609 W. 29th Street (at Guadalupe); apparently they will have lots of local beers on tap, which apparently was one of the downfalls of the recently departed World of Beer on South Lamar. -- Paul Qui's Otoko opens at the South Congress Hotel in early March. -- Gardner to close on March 11th; a new concept from the same team called Chicon, featuring wood-fired cooking, will open (hopefully) at the end of March. -- Space 24 Twenty at Urban Outfitters on the Drag will be starting a food truck residency with East Side King, Lucky Lab Coffee and Little Lucy's Donuts.